The EMBA program at Purdue has provided educational solutions for working professionals for more than 35 years -- Purdue's first EMBA class enrolled in 1983. The program features top Krannert faculty and speakers renowned for their expertise. It is consistently ranked among the top programs in the world. Features an international residency to enhance comprehension of the global competitive environment of business. Start your EMBA journey today! Email us your resume for review. We can determine initial fit with our EMBA program and discuss GMAT waivers. 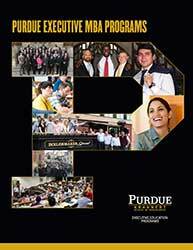 Purdue’s Executive MBA programs are structured so our students can live and work anywhere in the world while earning their advanced degree. Our format blends online convenience with on-campus learning and networking, allowing our students to travel to campus for classes only once every quarter. Purdue EMBA Class of 2018’s Toby McAuliffe takes us from his home in Seattle to West Lafayette for residency in this video. Inquire now to start a personal conversation about your career goals and how an Executive MBA from Purdue can help you meet – and exceed – those goals.